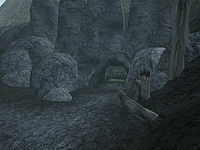 Zebabi is a small slaver's cave located south of Tel Fyr along the coast, in the Molag Amur Region. There are four rooms in the cave, two of which have locked gates to them. There are also two areas accessible only by Levitation. The notable loot would be some scrolls and random items in the crates and barrels and chests. There are four slavers here, and a couple of slaughterfish as opposition. The room with Draryn Andrano has some urns and a crate. There are some scrolls here, potions, two books, raw glass, and some random loot. There is also a cavern in the rear which is accessible only with Levitation. There is a small room beyond, with a copy of The Seed, a Dwarven battle axe, a couple Dwemer coins, a scroll of Flamebane, some potions, a grand soul gem, and some gold in bags. The crate has clothing, and the locked and trapped chest contains more gold. The Zebabi Slave Key also opens the gate to the storage room across from the Slave Room, where there are several crates and barrels, and a locked chest. You will find random treasure in the crates and barrels, possibly containing soul gems, jewels, potions, and weapons and armor. In the room with water, just before where Draryn Andrano can be found, there is a ledge above and to the right, which can be reached with Levitation. There, behind a spiderweb, will be a small chest with jewels in it. Dunmer Battlemage 12 97 148 0 90 He carries the Zebabi Slave Key. This page was last modified on 8 September 2018, at 04:16.